A stunning and spacious two bedroom apartment with river views from both of the bedrooms and the living room. A large bay window is the perfect spot to watch the world go by. 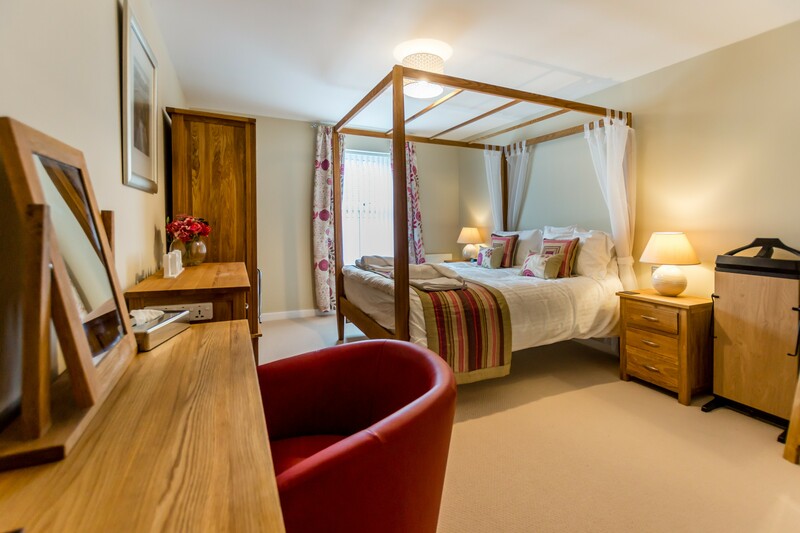 Newly refurbished throughout the apartment is immaculately presented with additional touches. The master bedroom is presented with a striking oak four-poster bed and en-suite shower room. This second floor apartment is accessed via a lift and benefits from an allocated parking space within the secure gated development. Complementary internet access via WiFi is provided. The spacious apartment offers high quality furnishings and appliances throughout with a flexible second bedroom that can be set as a king-size double or as a twin room. There is an excellent view of the River Ouse from the living area. 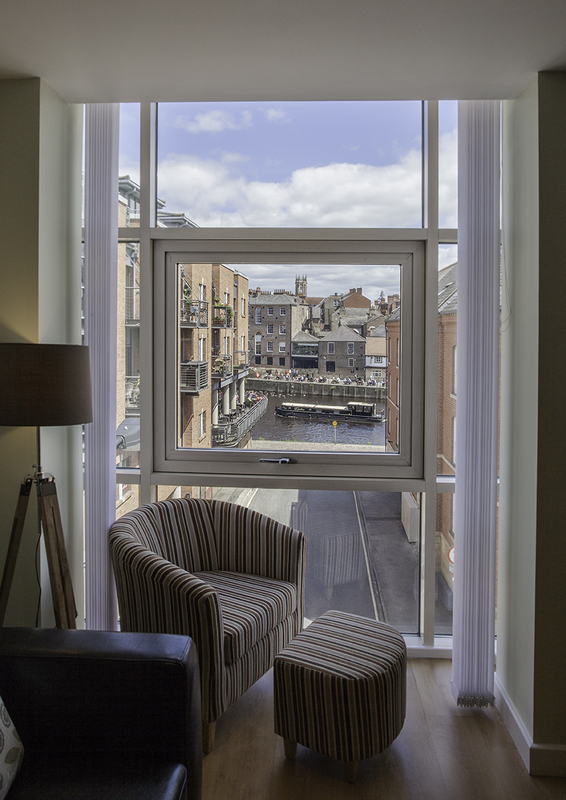 The large living area features a bay window overlooking Skeldergate and the River Ouse. The space is appointed with a leather sofa and chair and solid oak furniture. A large smart TV with Freeview, DVD Player and Xbox games console. An ipod docking station is also provided. A small selection of board games, DVDs, books and local guides are also available to you during your stay. 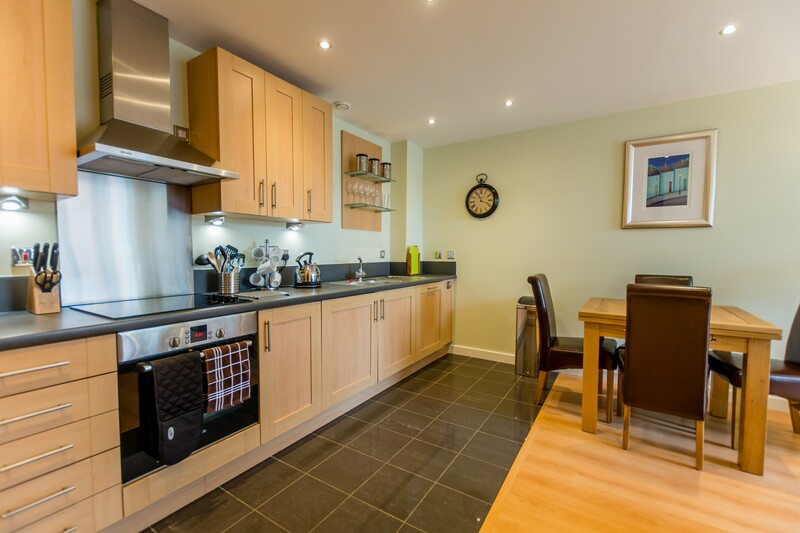 The kitchen is fully equipped with quality appliances with everything you would expect to find in a luxury service apartment in York. Appliances include a fridge freezer, an oven, a hob with extract fan over, a microwave, a washer dryer and dishwasher. The extending oak dining table can seat 4 people comfortably. The master bedroom with en-suite shower room features a king size oak four-poster bed and oak furniture. All linen and towels are of luxury hotel standard and the room is equipped with a clock-radio, trouser press, hair dryer, full length Cheval mirror and plenty of storage space. The second bedroom with view of the river can be set as king-sized double or as a twin bedroom. The room is equipped with a clock-radio, full length dressing mirror, hair dryer and plenty of storage space. 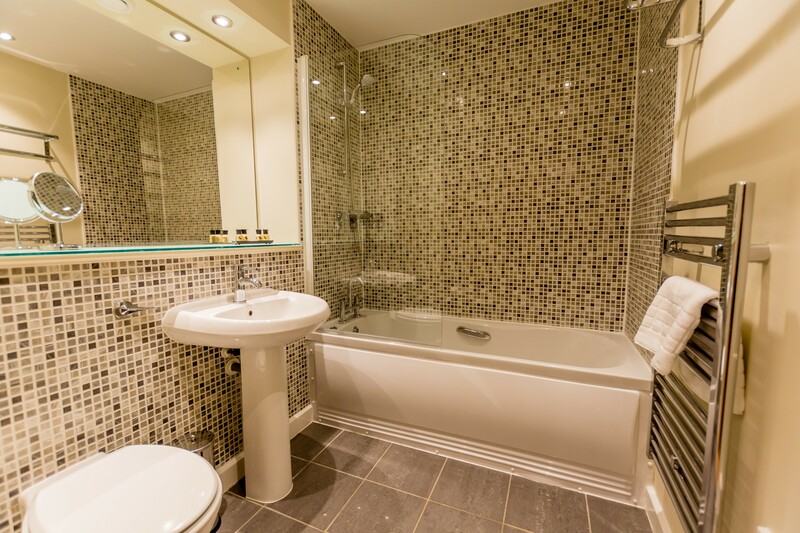 The tiled bathroom has a shower over the bath, heated towel rail as well as a well lit vanity area. 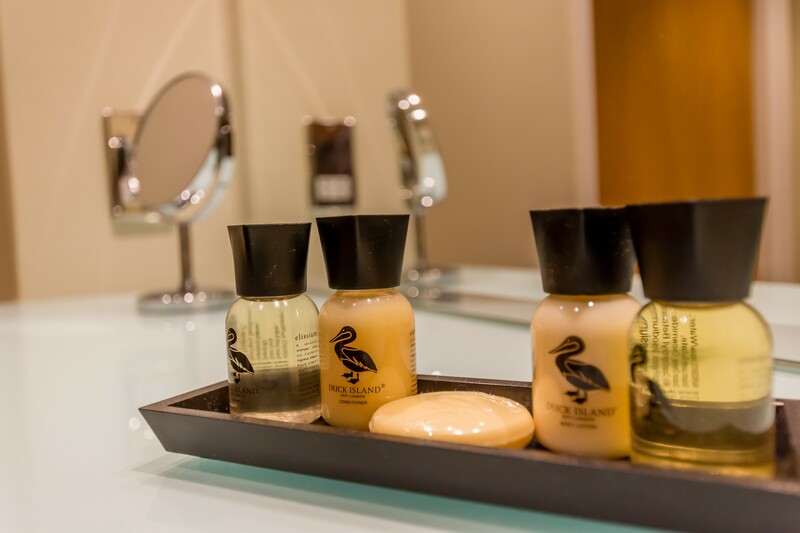 Complementary toiletries and facial tissues and provided for your arrival along with large bath towels. There is a large quiet and secure landscaped communal garden with seating where you can spend quality time reading a book after a busy day exploring the city. Secure bicycle storage facilities are also available. Bookings are for a minimum of 3 nights. The rates shown are for a 3 night and 7 night stay. A deposit of £100 will also need to be added to the booking confirmation and will be returned after checkout. 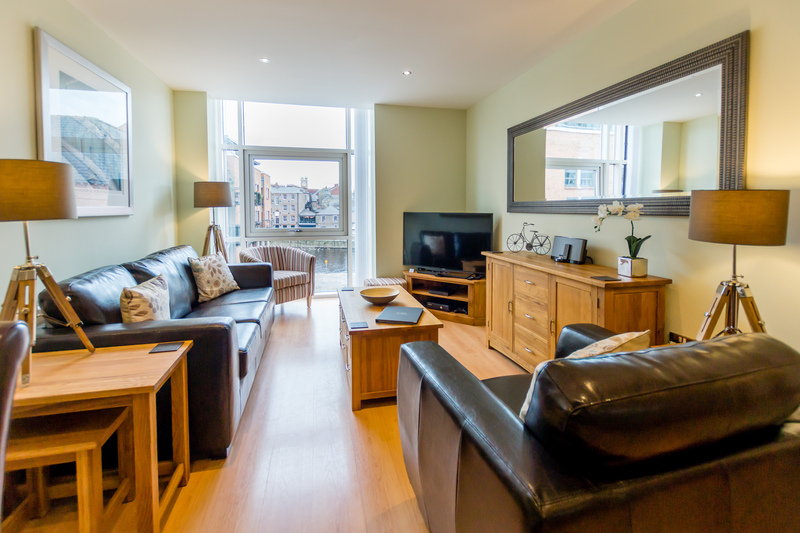 River View is a luxury serviced self-catering two bedroom apartment in York City Centre with everything you will need and being centrally located all that York has to offer is within easy walking distance so there is no need to spend money on transport into the City. Availability can be checked by clicking on the Availability tab above. We can quickly provide a more accurate quotation on receipt of the enquiry form, found via the Enquiries menu. Bookings are for a minimum of 3 nights. 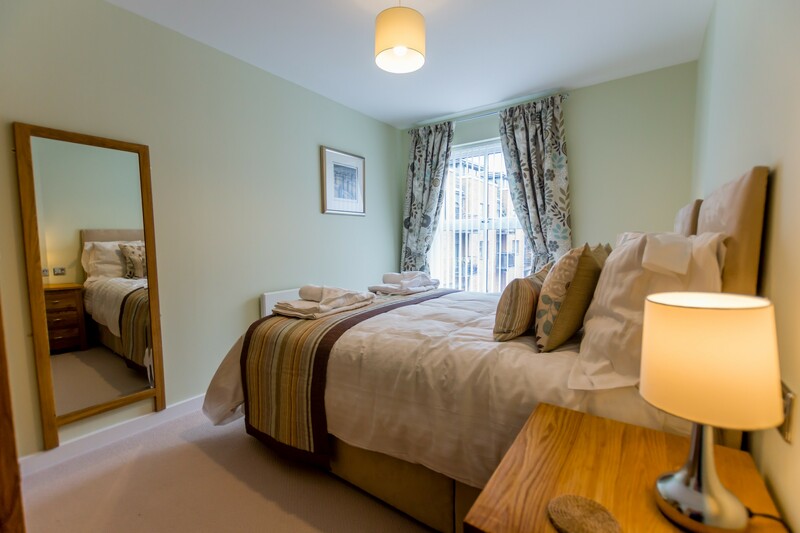 The rates as shown on the 'Rates' tab are for a 3 night stay at £175 per night and a 7 night stay at £1200 per week.